Two European projects are hoping to pave the way for commercially viable power generation using nuclear fusion – a breakthrough that could make a massive contribution to our energy and climate change worries. We put your questions to the scientists and engineers working on these ambitious and fascinating schemes. 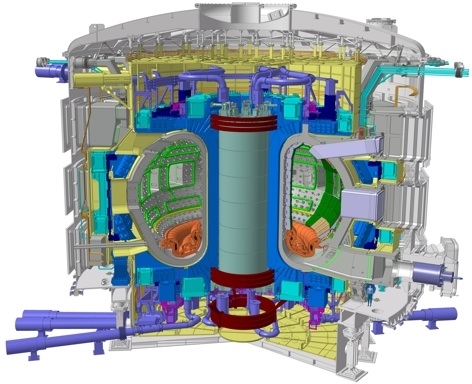 Thank you to all readers of The Engineer who sent in questions for the teams at ITER – the project to demonstrate the feasibility of magnetic-confinement nuclear fusion that is currently under construction in Cadarache, France – and its predecessor and pilot project, the Joint European Torus (JET) at Culham in Oxfordshire. In 1997, JET set the world record for producing the largest amount of power (16MW) from fusion using deuterium-tritium (D-T), the fuel proposed for the first generation of fusion power plants. After a period of upgrades, the project is preparing an attempt at breaking that record. The follow-up programme, ITER (International Thermonuclear Experimental Reactor), will attempt to go a step further and generate more power than is used to start the process. Experts from both projects have provided the answers to your questions you’ll see here. The Engineer will continue to report on this fascinating project, as well as the parallel efforts in intertial-confinement or laser fusion currently taking place in the US. What are the safety and environmental hazards of fusion (including waste), what protection systems do you have in place to deal with this and how does this compare to nuclearfission plants? The fuels used in the fusion reaction are inherently less hazardous that those used in fission. Typical input fuels for fusion will be deuterium and tritium – both isotopes of hydrogen with the latter being radioactive. The products of the reaction will be helium and fast neutrons. The neutrons can cause activation of materials they pass through. As a radioactive gas, tritium is a very low energy beta emitter and has a half-life of about 12.6 years. However, it is highly mobile and can contaminate most materials it comes in contact with. 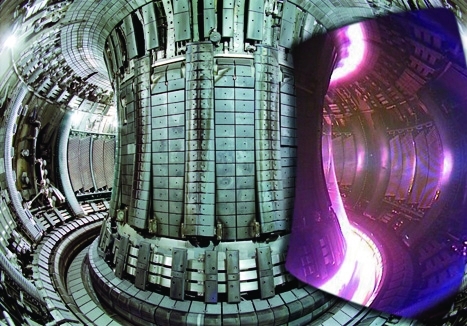 All fusion machines vary but JET, located at Culham in Oxfordshire, and ITER, being constructed at Cadarache in France, will both have their inner, plasma-facing walls constructed mostly of beryllium – a toxic metal, which presents significant health hazards if minute particles are inhaled. In practice this means the major hazards associated with operating JET or ITER are beryllium contamination, radiation from fast neutrons, tritium and the activation products in components removed from the machine. There is no possibility of the reaction going critical – a major failure of the tokamak and loss of vacuum will merely lead to the loss of the plasma and thus the reaction extinguishing. During a reaction the level of neutron flux is such that all personnel are excluded from within the biological shield (thick concrete containment) whilst the machine is operating. All operation and maintenance of the machine is overseen by health physics staff who monitor levels of tritium and beryllium, declaring radiological and/or beryllium contaminated controlled or supervised areas as necessary. With regard to waste, the first thing to say is that the production of waste is relatively modest, with most coming from maintenance activities or redundant components when the current research machines are re-configured. The main concern with the waste is radioactive contamination both from tritium and activation products, which will be relatively short-lived. Whilst much of the waste will be below the thresholds to even be considered as radioactive waste, there is some low level waste and a very small proportion will be classified as intermediate level waste. However, within 100 years or so, all of this material can be recycled or disposed of conventionally, leaving no long-term radioactive legacy for future generations to deal with. ITER will not generate any long-lived nuclear waste. Irradiated material will be transferred within a confinement cask to enclosed, shielded compartments (“hot cells”). Inside the hot cells several operations will be performed, such as cleaning and dust collection, detritiation, refurbishment, and disposal. 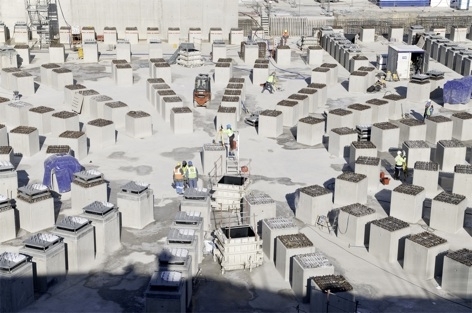 The waste, which is classified as medium level, will be stored in the ITER hot cells. All of these procedures are a part of the ITER operation as presented in the Preliminary Safety Report, and consequently are also submitted to examination of the French Nuclear Safety Authority as part of the licensing process. Detritiation systems in ITER have been designed to remove tritium from liquids and gases for reinjection into the fuel cycle. Remaining effluents will be well below authorized limits: gaseous and liquid tritium releases to the environment from ITER are predicted to be below 10 µSv per year. This is well under ITER’s General Safety Objective of 100 µSv per year and 100 times lower than the regulatory limit in France of 1,000 µSv per year. Scientists estimate our exposure to natural background radiation to be approximately 2,000 µSv per year. Why is it taking such a long time to return to experimenting with deuterium and tritium (D-T) fuel and how are you overcoming the problems you’ve experienced? The vast majority of JET experiments are done using deuterium only – which allows us to study most of the physics we need. JET has run experiments with deuterium and tritium (D-T) in 1991, 1997 and 2003, and it is proposed to perform further D-T experiments in the coming years. The overall use of tritium at JET is limited, as D-T fusion neutrons cause radioactivity in the JET vessel and the cumulative radioactivity of the JET vessel is limited due to decommissioning requirements. One of the problems encountered in the D-T experiments in 1997 was the in-vessel retention of tritium in carbon-based deposits. JET has addressed this issue with the installation of all metal plasma-facing components, avoiding the use of carbon. Significant progress has been made in the manufacturing of ITER magnets. More than 350 tons of toroidal field conductor (Nb3Sn strand), which corresponds to 75% of the total amount needed, have been produced by the 6 Members involved. This is the biggest production ever in the world. Also, 65 tons of poloidal field conductor (25% of supply) have been produced by China, Europe and Russian Federation. 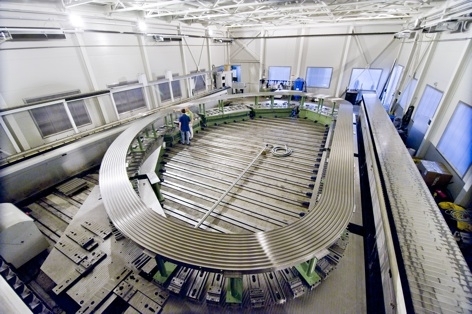 It is true that we have some delays in the manufacturing of the poloidal field coils due to complications in placing the contract rather than due to any technical issue) and it took also some time to develop high performance conductors for the central solenoid (the big central magnet (transformer) of the ITER tokamak). But work is progressing well. 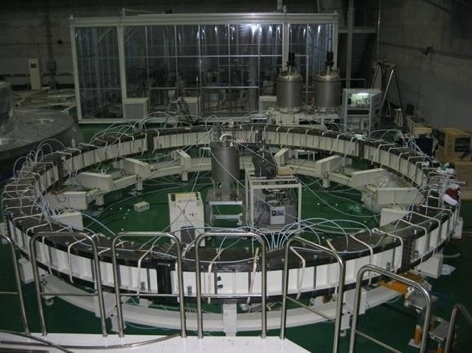 There is also good progress on toroidal field coil winding in Europe. ITER Members are still discussing possible testing at low temperature the toroidal field coils prior their assembly in the tokamak. These discussions are normal and are not seen as a major issue. All Parties remain committed to delivering on all fronts and in line within the ITER schedule. Could fusion energy be used in a different way to driving steam turbines for electricity production, either for commercial power generation or more niche applications such asspacecraft propulsion? Many people over the years have suggested using fusion for spacecraft propulsion. The ideas range from various types of direct thruster using the very high energy plasma ions emerging from the reactor vessel like a rocket jet (which would suffer from the generally small burn-up fraction of the nuclear fuel), through to variants where a reactor broadly similar to those we have in mind for electricity generation is used to do that in space, driving conventional electrically accelerated xenon (etc) plasma thrusters. Marine propulsion units, akin to today’s nuclear submarine reactors, have also been looked into. The presently valid scaling laws for fusion power gain lead to machine designs with large mass that are not suitable for mobile applications, but perhaps in the future more favourable empirical scalings will have emerged and such applications can be realised. Other applications include: the combined generation of electricity and hydrogen from a single fusion power plant, as part of a hydrogen economy; and the use of fusion energy to create heat to grow biomass plants, or at much higher temperatures to be used as process heat in industrial chemical plant. Fusion could be used as a source of neutrons. With ITER, we will have proved that we can harness a plasma and produce a steady stream of highly energetic neutrons. So an interesting question is: Can we find a better use for these neutrons? In a pure fusion reactor, the 14 MeV neutrons are slowed down in the blanket to produce heat, but they are not used to their full potential. Another solution could be to take advantage of their considerable energy to induce fission reactions in a blanket that would include some fission fuel, like natural Uranium (U 238) or Thorium. By doing this, the energy produced could be multiplied by a factor 10. This is what the ‘hybrid reactor’ is about. How has JET advanced material science and what other possible applications could there be for the materials created for JET? JET has had to develop materials technologies to meet its goals. A good example of the types of challenges and solutions is given by the ‘ITER-like Wall’ project which involved replacement of the carbon fibre reinforced carbon lining of the JET machine with ITER-relevant beryllium and tungsten. Vacuum casting of the high-strength alloy Inconel 625 was used to manufacture the carriers which supported the bulk beryllium tiles. Prior to this, the orthodox view was that cast components would not be viable in an ultra high vacuum due to gas trapped in leaky voids but vacuum casting followed by HIPing (annealing under high pressure) produced fully acceptable components. The JET requirements for beryllium machining also pushed the technology to the point that R&D was required on the limits of wire erosion and methods to remove zinc and copper deposited in narrow features during the machining process. To create a full tungsten surface in the divertor (the high heat load area in the bottom of the machine), a new process had to be developed for coating two dimensional carbon fibre material with thin layers of tungsten, which was challenging due to the anisotropic expansion of the material which compresses the coating in one direction and stretches in another during high-temperature cycling. These materials-related developments have proved very successful in JET. It is hard to say how these developments may be used in other areas, but we know that by asking manufacturing companies to go outside their normal comfort zone and supporting them through the process, we do help enhance their capabilities and give them the confidence to bid for more challenging work in the future. Cutaway view of the ITER cryostat, showing the tokamak surrounded by its field coils, kept cold to activate their superconducting properties. What is the biggest obstacle to making fusion technology commercially viable and what steps will we need to take after ITER to get there? One of the most interesting challenges is developing materials and manufacturing processes that can withstand the hostile environment of a fusion reactor where a high level of fast neutron irradiation causes damage at the atomic structure level and creates impurities by nuclear transmutation. This affects the bulk properties of the materials so that structural design is complicated due to variation of the material property throughout the body. When coupled with high heat flux and surface erosion rates, these effects preclude the use of most common structural materials; some special alloys have already been developed for fusion applications but more work is needed. To make fusion energy commercially viable, future fusion reactors will need to produce a positive balance of energy, to harness plasmas for several hours, avoid too expensive materials and, last but not least, find materials that are capable to withstand the enormous heat loads and neutron fluxes that are expected in a fusion power plant (some factors higher than in ITER).The objective of the ITER project is to gain the knowledge necessary for the design of the next-stage device: a demonstration fusion power plant. In ITER, scientists will study plasmas under conditions similar to those expected in a future power plant. 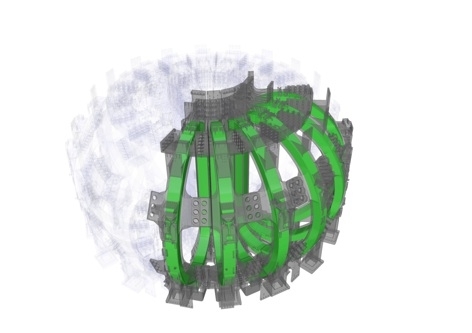 ITER will be the first fusion experiment to produce net power; it will also test key technologies, including heating, control, diagnostics, and remote maintenance. But ITER is not an end in itself: it is the bridge toward a first plant that will demonstrate the large-scale production of electrical power and tritium fuel self-sufficiency. This is the next step after ITER: the Demonstration Power Plant, or DEMO for short. A conceptual design for such a machine could be complete before 2020. If all goes well, DEMO will lead fusion into its industrial era, beginning operations in the early 2030s, and putting fusion power into the grid as early as 2040. Actually, there is not one DEMO concept being discussed, but there are several concepts developed by various countries. We can mention here the recent IAEA workshop in Los Angeles. What is your best estimate of when fusion power will be able to supply electricity to the grid? The most recent European roadmap for the realisation of fusion energy foresees a demonstration fusion power plant to put electricity on the grid in the early 2040s. JET has demonstrated fusion power – however, the challenge of making electricity continuously and at a competitive price is considerable. Much of this challenge involves the development of suitable materials that remain robust and strong in the challenging environment of a future fusion power station. Are there likely to be any problems in obtaining enough fuel to run an industry’s worth of power plants and, if so, how will we tackle this issue? The fuels that will be used in fusion power plants are deuterium and tritium. Deuterium is extracted from seawater and supplies are therefore virtually limitless. Tritium is more of a problem as its natural abundance is low and it must be produced from lithium in nuclear reactors. A fusion reactor generating 1GW(e) at 40% thermal efficiency will burn about 0.5kg of tritium per day and the burn-up fraction of the tritium is approximately 3%, so 15kg of tritium must be circulated to generate that 1GW(e). Given that the current world civil tritium stock is around 30 kg, it is essential for the fusion reactor to have an efficient tritium breeding system. This is planned in the form of lithium-containing blankets surrounding the tokamak in a fusion power plant. Present technology being developed uses the reaction between the neutrons produced in the fusion process and lithium held within a ceramic-beryllium matrix or as a LiPb eutectic liquid. The beryllium and lead act as neutron multipliers as the blanket must produce more than one tritium atom per incident fusion neutron (the tritium breeding ratio, TBR) to be viable. Simulations to date imply TBRs around 1.2 might be achievable but, as yet, there is no source of 14MeV neutrons of sufficient intensity to test these designs. Tritium can also be trapped inside the fusion plant by the action of the plasma driving the ions into the wall and diffusion effects. This increases the required TBR; in the case of carbon walls TBR~1.3 is needed, which is the reason for abandoning this material in future tokamaks. Clearly efficient recovery and recirculation of the tritium, in addition to effective TBR, is necessary to the fusion economy. On paper, there is enough fuel to run fusion plants worldwide. However if the aim is to use a mix of deuterium and tritium, you have to sort out the issue of tritium supply. Tritium virtually does not exist in nature (it has a half-life of 12.5 years). So the success relies on breeding the tritium inside the reactor. 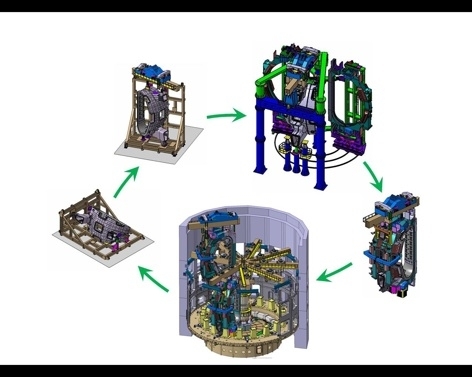 One of the missions for the later stages of ITER operation is to demonstrate the feasibility of one or more concepts of tritium production through the so-called “Test Blanket Module” (TBM) program. The TBM program will build on tritium breeding studies that have been carried out for a number of years, in particular by the European Union which has substantial expertise in this field. The accumulated knowledge permits a high level of confidence that results from ITER will contribute to full tritium self-sufficiency in next-generation devices. See also our video on TBM. In your opinion, is support for fusion among politicians growing or declining? Political support has increased, especially in China and South Korea, where the desire to see commercial fusion is highest. Support in Europe remains robust, which is crucial as Europe contributes to almost half of the ITER costs. In the UK, there is good support from the Chief Scientist to the UK Government, Sir John Beddington, and the Science Minister David Willetts. I would say it is stable. This is actually a very good result, given the current difficulties (economic crisis etc). However, there are big differences from one country to another. Germany, for example, which is opposed to nuclear fission, is becoming very critical about fusion. Several readers have questioned the value of committing such large amounts of money to a project that has already taken many years and isn’t likely to produce a commercial solution to our energy needs for decades to come (if at all). What would you say to them to persuade them that fusion is a worthwhile investment, particularly over other already-proven alternative energy technologies such as renewables? Energy is such a fundamental aspect to our lives and a key component in the world’s economy, that spending on research into all forms of alternative energy production should be much higher than it presently is. Current spending on fusion, and other alternative systems, is virtually negligible when you consider the size of the energy market globally and the scale of the problem that will face future generations if we don’t make an investment now. The intermittent availability of renewable energies, such as solar and wind, limits their use for large-scale electricity production in the absence of viable energy storage solutions. Therefore, more research is required to further develop wind and solar technologies, together with the development of Generation IV fission stations, carbon capture and storage and fusion. With energy demand growing at an alarming rate, fusion energy has the potential to provide a long-term environmentally responsible solution for baseload electricity production. Today at JET, it is a fairly routine operation to heat plasmas to 200 million degrees, initiate and maintain a fusion reaction in a controlled and predictable way, and understand and improve plasma performance. ITER is designed to achieve an energy gain of at least ten, and should demonstrate that a fusion power plant is feasible. This means that fusion could be providing an invaluable extra energy option from the middle of this century. In David MacKay’s book “Sustainable energy without the hot air” he says about nuclear fusion that: “…there’s enough deuterium to supply every person in a ten-fold increased world population with a power of 30 000 kWh per day (that’s more than 100 times the average American consumption) for 1 million years”. It is this potential that justifies the fusion programme. It is very simple: we cannot afford not doing ITER and not trying to show that fusion could become a new energy source on Earth.If ITER succeeds, it will open the doors not only to a new source of energy on Earth but also to peace worldwide as the very large inventory of hydrogen (the fusion fuel) on Earth is expected to diminish geopolitical tensions. With regards to the money, the cost of ITER construction is estimated at 13 billion euros. This has to be divided by 34 countries and 10 years. It is therefore a small amount in the Member’s budget. Could you explain the neutron economy of a working system? Hi I’m not a nuclear physicist I’m just a simple millwright that works at a sawmill I have an idea for the tritium reactor sense trying to keep the gases in the stable formation with magnets is like example hurdling catshave you ever thought about adjusting the amperage flow to exceed the safe containment field around in a circular motion just raising the power level just .01% going clockwise around the containment Field theoretically thinking about it would be like turning a spoon and a glass of water you’ll get the flow of gas to go in one direction thus being able to control it. Another idea for the containment wall be a style ceramic something that is able to take millions of degrees in temperature then have a cord center of it being lead which I know will boil but hopefully would be protective enough to prevent radioactive particulates escaping then you can wrap that with the heatsink transfer of some kind to turn a turbine that’s just a simple millwright talk. Good job Europe, especially in the magnet Mfg. Forty years ago we, the taxpayers, were promised “nuclear fusion electrical generation within 30 years.” We are still being told “within thirty years”. I don’ t believe the people working on this project actually know what they will achieve. It just appears to me to be a never-ending gravy train. Discuss. Was the system called PACER fusion designed and component tested by LLNL and LANL national labs in the United States not a practical system for generating D-T and D-D fusion? While PACER fusion reliably produced the conditions to ignite a fusion plasma by using a tiny amount of fissile material as an igniter (nuclear fission was used to produce fusion), is it not worthwhile to as a planet start to generate fusion energy using the PACER fusion approach rather than waiting another 30 – 50 years for tokamaks to produce commercial energy at a reasonalbe and competitive cost? ITER concept is very problematic. Well, even if the ITER succeeds, the cost of energy generated will be so expensive that will be hard to compete with other forms of cheaper energy production. Thus, my bet is on electrostatic fusion machines. It would be great if this huge effort by “big science” would – after spending increasing billions of euros – produce net energy in about 50 years or so. Funded with 5.5 million USD the university of Missouri is going after this topic with scientific method. IMO there needs to be a shift in focus on the approach to fusion energy generation. The JET research into Tokamak I think was valuable and money well spent, however I personally see ITER as a money pit. Tokamak research has probably given more insight into fusion, however as an energy generation solution I believe it to be a bit of a white elephant. Drawing attention (especially in the media, due to the level of investment) that it is the only plausible solution. The fundamental issue I predict with Tokamak is that at the point when it produces net fusion energy, let alone a net energy generation capability, more and more money will have been thrown at this technology with little or no benefit. The other media attractive fusion technology is NIF, but this has no intention to be an energy generation system, it’s purely for weapons research. But I do see some of the other concepts being much more realistic, with direct generation being the critical factor. The reason I state direct generation is that the net energy gain can be lower for a workable commercial reactor. The additional upside of these concepts is they tend to take an Aneutronic reaction approach, i.e. there a very few high energy neutrons produced by the reaction. Eliminating a lot of the waste issues mentioned above. Also the concepts tend to allow for a much smaller reactor. Large centralised systems and steam generation suit the big energy companies, hence the investment, but I think more needs to be spent on the other concepts. Additionally: In the originating questions article it stated that no one had created a net energy fusion reaction, this is incorrect. See Hydrogen bombs. NIF has a military purpose indeed. NIF started their history as one of the project of Stockpile stewardship and Management Program. Experiments for management of thermonuclear bombs are performed with NIF system as well as for energy generation. If I remember correctly, most of the budgets for NIF are still military budgets. All critical technical aspects of PACER fusion were repeatedly demonstrated by LLNL and LANL field test division in a succession of 800+ nuclear tests including 80 tunnel shots at the Nevada Test Site. PACER fusion produced commercially significant Gigawatt levels of fusion power from its first demonstration in the Ivy Mike test of 1952. While a peaceful nuclear explosive bear linage with small tactical nuclear weapons, they are refined and specialized devices designed to maximize power generated by fusion while minimizing use of nuclear fission. Field demonstrated devices demonstrated yields of in excess of 97% of their energy from fusion, and PACER optimized devices are expected to produce over 99% of the energy they release from fusion. PACER is, aside from the actual PACER device – which is a modern advanced nuclear design, a low tech power generation system that requires only demonstrated fluoride molten salts and commercial steam power plant turbine-generator technology. LLNL and LANL both produced preliminary PACER nuclear explosive designs. PACER fusion reactors could be operating in 3-years providing commercial electrical power to heat homes and light factories. Why wait 50 years for an economical cost effective commercial implementation of laser fusion or magnetic confinement fusion? Why not introduce practical D-D and D-T fusion decades earlier using tiny amounts of fissile material to reliably create the conditions to ignite fusion plasma and produce commercial amounts of power? Inertial confinement fusion energy is doomed since one can never shield the line of sight lenses or mirrors from the high energy neutron damage. Magnetic confinement fusion is doomed since a reactor cannot be built without testing the components – and this is impossible without a working reactor. Catch-22 comes to mind. How come nobody came knocking on your door to work on the ITER project? You’d think they would have given that you know more about it than the experts working on it. Being a retired mechanical engineer, I have read your various articles on Fusion with interest and a reasonable grasp of the process. Am I the only one here who has heard of Lockheed Martin’s step into fusion and the new timeline is 5 years? Where does the E-Cat sit in this – a much cheaper less hazardous energy source by far yet very few seem to be taking it seriously despite independent evidence as to it’s energy production. Smacks of Oil Baron’s all persuasive influence that other cheap power sources other than fossil fuels are to be brushed under the carpet – and scientists working on multimillion dollar projects don’t want to lose their funding!! !